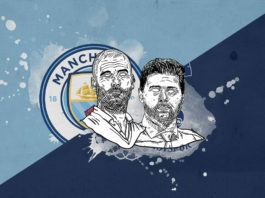 Coming in the Premier League with new ideas and tactics is not something easy. 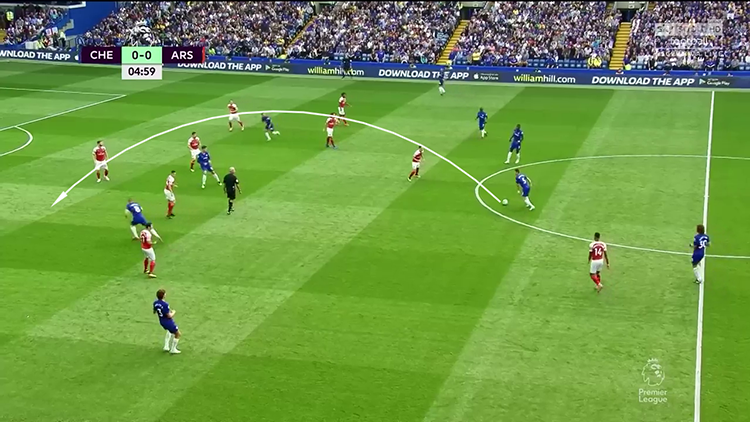 Maurizio Sarri and Unai Emery have two similar approaches, a mix of pressing and possession game but implement these schemes in England is not as easy as in Italy or Spain. The last game facing Chelsea against Arsenal (3-2) demonstrate how the two managers have still work to do to make the best of their team. 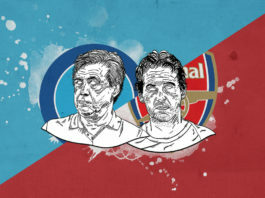 In this piece, we’ll look closely at how both Chelsea and Arsenal are not equally balanced tactically and how it influenced their performances. This second Emery game allowed us to see new features brought by the former PSG manager. With injuries of Kolasinac (and Maitland-Niles), he aligned Nacho Monreal as left back and Bellerin as right back. 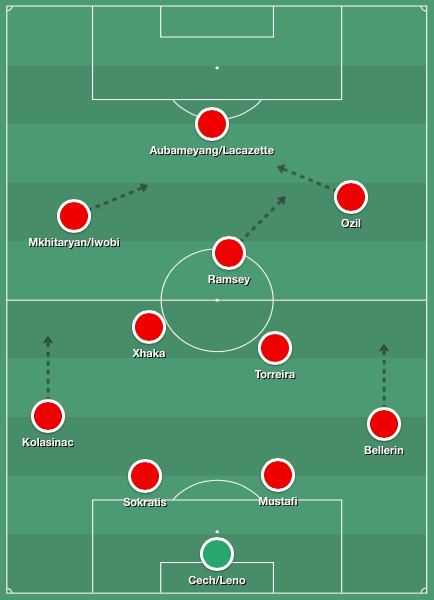 In Emery tactics right and left back are essentials pieces of the team, especially for the pressing. Unlike other lineups in 4-2-3-1, it is not the duo in the midfield to cover their winged defenders. Indeed, Emery asks the wingers to swap with the defenders when necessary and thus cover the blanks. 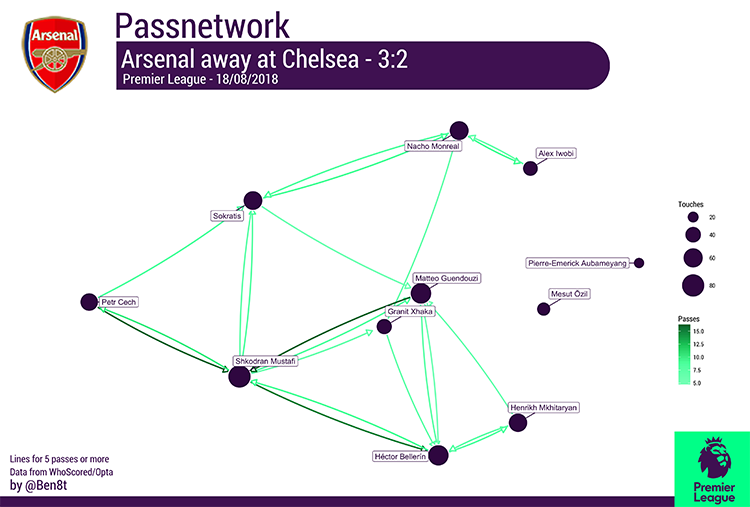 This tactic in place is more for attack purposes: the passnetwork below shows how the relationship between wing backs and wingers is important in Emery tactic. This relative small distance between them is perfect in attack to create space on the wings, wingers like Iwobi or Mkhitaryan here can easily come in the midfield and create overloads in midfield opponent. Therefore this tactic worked well in attack, moreover with Chelsea feverishness in defense (see next paragraph). Coming in the Premier League with new ideas and concepts is not something easy. 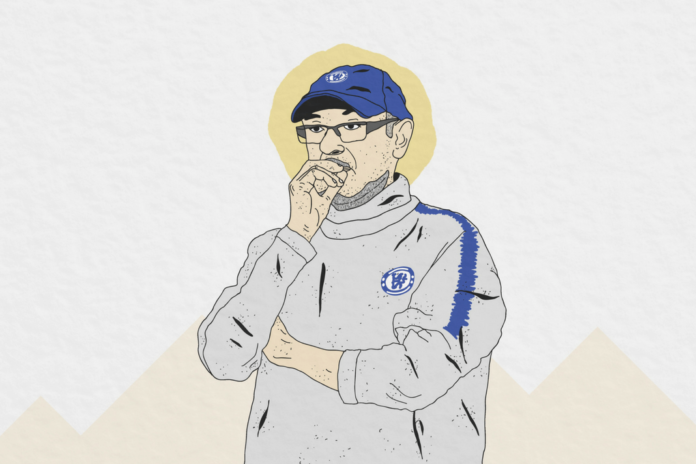 For Maurizio Sarri the first appraisal is quite good, especially in attack. 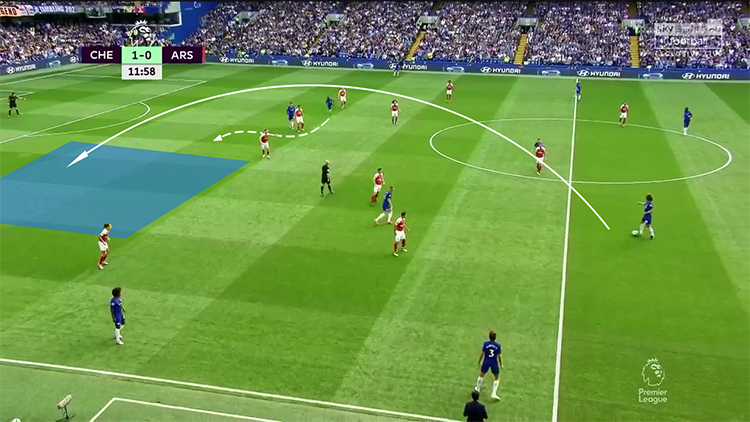 When Chelsea has the ball there are two main patterns: either go on the wing and create overloads with wingers coming into the midfield or use passes quality from Jorginho or David Luiz to provide a breakthrough in the opponent’s defence. In this game, we saw more the second pattern. 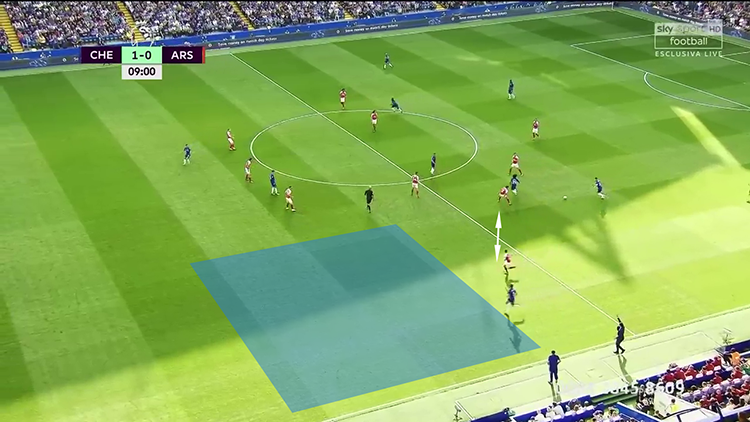 When the Arsenal pressing was cleared, Chelsea could slow the game and start building from the back. 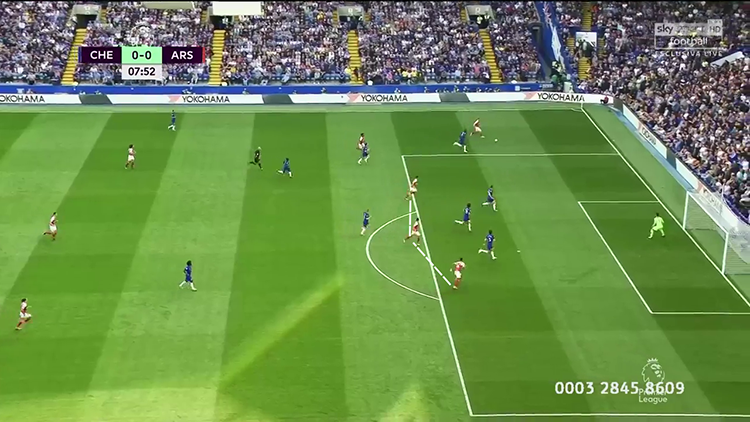 The pictures below show a special tactic directly imported from Sarri tactics: a deep-lying player (Jorginho/David Luiz) has the ball, look up, offensive midfielders or wingers start to run and then “boom”! 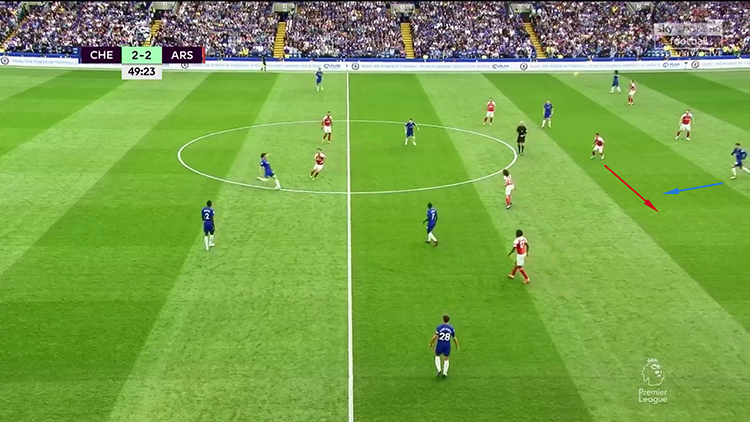 In two passes Sarri succeeds to bring danger in the opponent’s defence, a bit like an American Football set up. 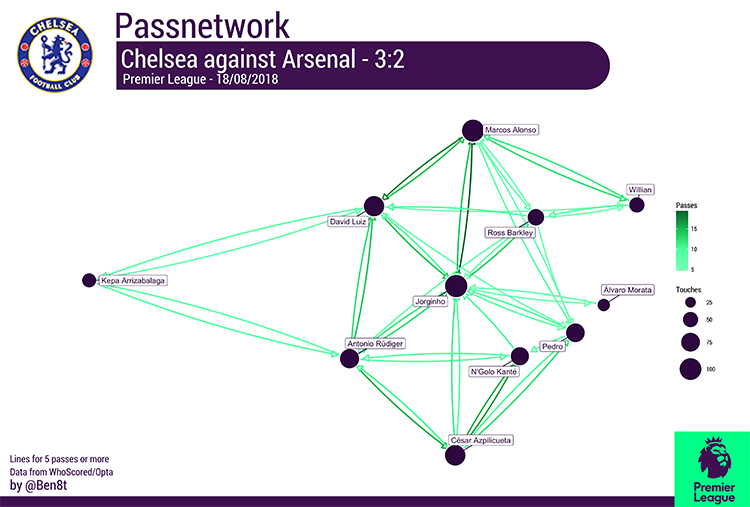 The passnetwork confirm this idea, underlying Jorginho importance, Willian-Barkley and Pedro-Kante relationships and influences in runs. However, in defence is not the same story. When Arsenal played in possession phases and so Chelsea defence was placed, almost all was good. But when Gunners played fast and on the wings, Chelsea defence was a bit brittle. Most of the time, it was due to midfielders who did not come back to help their defenders. Therefore most of Arsenal chances was about back passes into the box area. 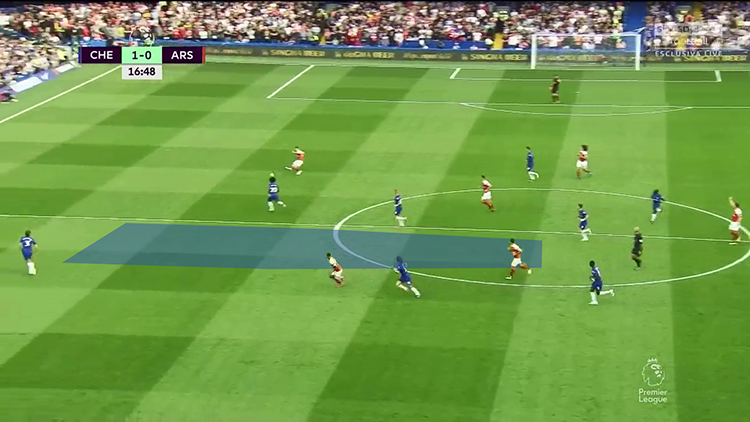 In other cases, the quality of Arsenal passes allowed creating breakthroughs while Chelsea midfielders was a bit late to cover spaces. While Kolasinac was in the starting eleven after being injured after few minutes against Manchester City, we can think that Emery made him his first choice as left back this season. In fact Kolasinac sharper than Monreal in his moves ahead. The Spanish have good cross qualities but he is too limited in his speed and stamina to provide what is needed from Emery tactic (talked above). Though the young French definitely has talent, it doesn’t justify his place in the first team. Moreover, he doesn’t bring what’s needed in Arsenal: a strong midfield to cover an attack which doesn’t defend so much (at all ?). Either Ozil, Mkhitaryan or Aubameyang are not the perfect first line to defend. Comparing to other teams and you see how it can be a key to explain the deceptive Arsenal defence. The main reason to not put Torreira in the starting eleven is his ignorance of the Premier League but we can say the same for Guendouzi. For Chelsea, it’s less serious while there are fewer problems. The defense has some difficulties in covering during the transition just after the end of pressing. 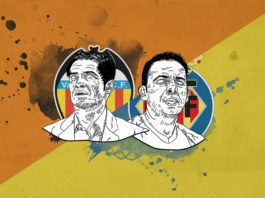 These two managers are participating in the tactical evolution of the Premier League which is underway. However, they have not yet managed to import all their tactics and they are still discovering the limits and speed of this championship. Let’s give them some more time to adjust their games and see what they will bring tactically.